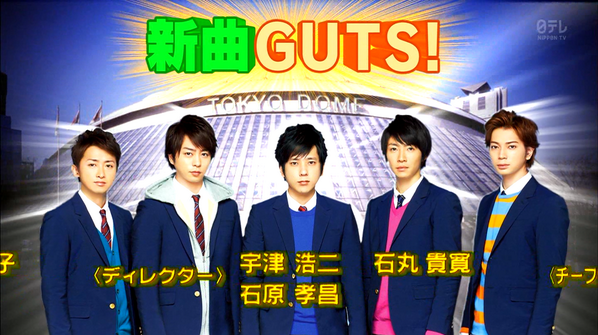 Not-so-breaking news: Arashi will perform GUTS, the theme to Nino’s drama, in TOKYO DOME for SHIYAGARE. In TOKYO DOME. For one song. Not even a concert. Or, as what they will call in K-pop, a showcase. Many artists dream of performing at KOKURITSU and TODOME. And here’s Arashi using it for one bloody song. Maybe they can throw in Daremo Shiranai, the theme to Riida’s drama? Wishful thinking I know considering the network politics involved. How about the coupling songs to GUTS? More on this later. It took them eight years to perform at TODOME. And nine years to perform at KOKURITSU, which has been their concert base for six years. As @ArashiTsu noted, TODOME is a baseball stadium and GUTS is the theme for a baseball drama so it does fit perfectly. But isn’t it crazy?! The GUTS PV is made of the Arashi crack. It reminds me of Kitto Daijoubu while it reminds others of Troublemaker or Happiness. It’s the usual Arashi dorkiness but with Riida’s baseball dance choreography. It’s so entertaining watching them, not to mention that the melody is so catchy. It’s nice how Arashi still knows how to do a crack video like this despite the expectations they carry on their shoulders. Just goes to show they don’t take themselves seriously and if you need further proof, there’s Aiba’s shoe flying in the first few seconds of the PV. And again, can I say, I love it when they highlight the member who has to do with the song, in this case, Nino. That’s teamwork, Arashi style. Among the coupling songs, I love 君が笑えるように. Meanwhile, Love Wonderland, which is Jun’s favorite among the coupling song, is a funky tune and I can understand why Matsumoto, who has a wide range of musical taste, likes it. For more on Love Wonderland, check out @FireStorm_HK’s post on it. 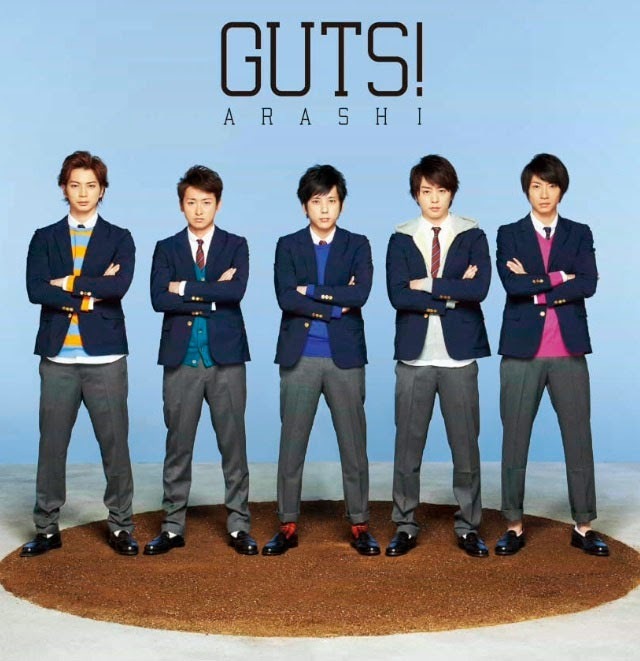 GUTS is a total win: An earworm for a melody and Riida’s ingenious choreography. I can just imagine what it would be like performed live. Can’t wait to see the performance at TODOME. Only Arashi will have the GUTS to do this. For me, it reminds me of a mixed of We Can Make It + Step n Go! Iyaaaaaaaaaa, I wanna see their Making T T (we got such a nice Making for both We Can & Step&Go. Got spoiled so hard XDD). I dont follow every boy band group nor Johnnys group. But, I watched almost all drama (esp the ones with ikemen XDD Johnnys too. Although it was years ago!!) So, I can say I know at least a bit, like the OST./theme song by other Johnnys groups. Arashi is the only group and or the first group to sing almost all their members drama’s theme song diligently. After Arashi big break, around 2010, other groups were started to follow the method. I always see how Arashi&their staff made the member that starred in the said project to have a limelight. Either in dance choreo, in tv shows and in music shows. I can’t talk enough about the give and take attitude of Arashi. it’s deeply ingrained in them and they don’t begrudge one another of that limelight. it makes me so proud and at the same time humbling to see them like that when we see a lot of selfish attention-whores in the entertainment business. more than anyone, Arashi realize that the five of them together is more powerful than anything. and they work on that. And beuatifully, I wanna have little of their good example too. I've been smiling and laughing more than I was 4years ago. I do love how Arashi can still nail these crack videos even when they’re kind of past the “late-night TV” stage in their careers. The crackiness has gone out of a lot of their shows (when was the last time we saw something like Aiba Sugoroku on an Arashi variety show? ), but the boys have shown time and again that the cracky spirit has not left them, no matter how old they get. Thirties, you say? One can never grow too old to have good, shameless fun. And this GUTS PV… man, I’m watching it just as many times as I watched that delicious serving of PARADOX. Thanks for the shout-out to my song review ❤ These past two days have just been great for Arashi fans. Not enough hours in a day to get all mah fangirling done!! hye, first time comment in ur blog, just read only before this. however, i agreed with you. that is just Arashi style, even Ohno-san choreo the song, but he is not in the centre. It is Nino-san. Same with bittersweet as Matsumoto-san was at the centre. It is also remaid me of Sakura Sake pv. Btw, AWESOME blog. thank you for dropping by and commenting! and for the kind words. yes, also in Daremo Shiranai, Riida was at the center of course since that’s for his drama.